I became a big fan of Siobhan Fallon after reading her 2011 collection of stories, You Know When The Men Are Gone, which is about military families living on army bases in the U.S. 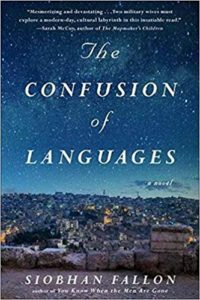 Her first novel, The Confusion of Languages, came out this summer and I was eager to get my hands on it. It did not disappoint. Cassie and Margaret are two American women living in Jordan while their husbands are stationed there. Cassie has lived in Jordan for a few years and knows the rules and expectations for expat wives. But she’s lonely in her marriage, frustrated by her inability to get pregnant and to connect with the other wives. When Margaret arrives, Cassie is happy to take her under her wing, spending time with her and her young son and teaching her how to comport herself in a Muslim country during the Arab spring. Margaret is dealing with insecurities of her own, and living in Jordan is the first time she has ever been away from her claustrophobic home in Northern California, where she lived with her chronically ill mother. She wants to explore Jordan and make friends with the guards and the building superintendent, even though it is inappropriate for her to have contact with them. She is open and friendly and flirtatious, in stark contrast to Cassie’s tightly wound primness. Yet these two women become good friends and Margaret comes to depend on Cassie a lot. But how well does Cassie really know Margaret? They get into a minor car accident one afternoon, and when Margaret has to drive to the police station to sort it out, she asks Cassie to stay with her son. The hours pass, and Margaret doesn’t return. Cassie, restless in the apartment waiting for Margaret to come back, discovers Margaret’s journal and discovers that there is a lot she didn’t know about her friend. The book teases out what’s really been going on in Margaret’s marriage, the tensions that have been growing between the two women, and the relationships that Margaret has been cultivating on the side. I didn’t love The Confusion Of Languages as much as Fallon’s earlier book, but I liked it a lot. She is a great storyteller, maintaining tension throughout the book and building suspense. She’s also incisive and observant, just what you want in a novelist. I didn’t love the ending, but I enjoyed the ride quite a bit. Give this one a try if you’re fascinated by military marriages (like I am) and want to be transported to a very foreign place. Posted on August 23, 2017 by gayle. This entry was posted in Fiction and tagged siobhan fallon, the confusion of languages. Bookmark the permalink.